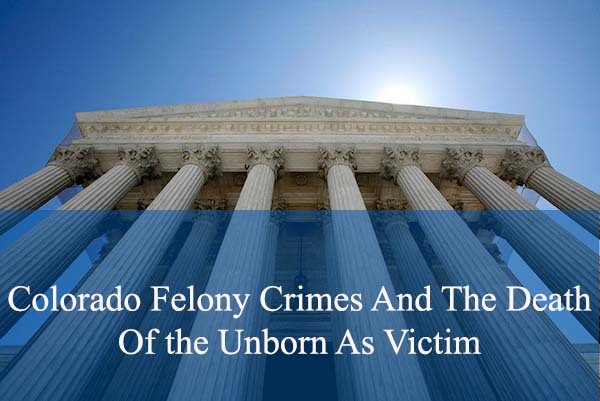 Colorado Felony Crimes And The Death Of the Unborn As Victim – This article addresses whether an unborn child, who is a victim of certain felony and misdemeanor crimes – and who later dies after birth – can be a victim of certain Colorado crimes. (2) ” Person”, when referring to the victim of a homicide, means a human being who had been born and was alive at the time of the homicidal act. (3) the victim is still alive. Colorado’s Homicide Law – Section 18-3-101(2) – is clear and unambiguous on this point. For a child to be a “person” under this law – he or she must have been born and alive at the time of the homicidal act. the death of the child who is alive, but not yet born, at the time of the homicidal act, cannot be a victim of homicide. Contrary to Colorado Homicide Law, a child who is unborn that is “in utero” at the time of the offense, who is then subsequently born alive, and dies as a result of the offense, CAN be a victim of under the plain meaning of the statutes defining these two crimes – Vehicular Eluding § 18-9-116.5, And Careless Driving – Resulting in Death – § 42-4-1402. Any person who, while operating a motor vehicle, knowingly eludes or attempts to elude a peace officer also operating a motor vehicle, and who knows or reasonably should know that he or she is being pursued by said peace officer, and who operates his or her vehicle in a reckless manner, commits vehicular eluding. If the Colorado crime of Reckless Vehicular Eluding results in the death of another it is enhanced to a Class Three Felony. Any person who drives any motor vehicle . . . in a careless and imprudent manner, without due regard for the width, grade, curves, corners, traffic, and use of the streets and highways and all other attendant circumstances, is guilty of careless driving. Again, if the Careless Driving it results in the death to another; the crime is enhanced to a Class One Misdemeanor Traffic Offense. § 42-4-1402(2). Here, as compared to the Colorado crime of Homicide above, the unborn child IS a “person” at the time of death and can be a victim of these crimes and that is because the terms “child” and “person” used in these laws include a fetus injured in the womb, born alive, who subsequently dies of the injuries. The Colorado Crime Of Reckless Child Abuse Resulting in Death , § 18-6-401 And Driving Under the Influence / Vehicular Assault § 18-3-205. A fetus unborn at the time of the infliction of injury, who later is born and survives for a period of time, can ALSO be a victim of Reckless Child Abuse Resulting In Death 18-6-401), and Vehicular Assault (and or Resulting In Death), § 18-3-205(1)(b)(1). .
A child who is born alive and subsequently dies is a person within the meaning of our wrongful death statute, and a wrongful death action can be maintained regardless of whether the child was viable at the time of the injury or whether the child was viable at the time of birth. The term “child” used in section 18-6-401(Reckless Child Abuse Causing Death) and the term “person” used in section 18-3-205 (Driving Under the Influence Vehicular Assault/ Homicide) includes a fetus who is injured while in the womb, is subsequently born and lived outside the womb, and then died from the injuries sustained. You should be careful to make a responsible choice in selecting a Colorado Criminal Defense Lawyer – and we encourage you to “vet” our firm. Over the last 30 plus years – by focusing ONLY on Colorado criminal law – H. Michael has had the necessary time to commit to the task of constantly updating himself on nearly every area of criminal law, to include Colorado criminal law and procedure and trial and courtroom practice. H. Michael works hard to get his clients the best possible results in and out of the courtroom. 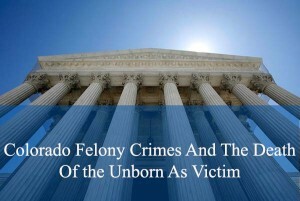 He has written, and continues to write, extensively on Colorado criminal law and he hopes this article helps you in some small way – Colorado Felony Crimes And The Death Of the Unborn As Victim. This article addresses whether an unborn child who is a victim of a crime - who later dies after birth - can be a victim of certain Colorado crimes.